Nest Labs, the home hardware maker co-founded by two ex-Apple luminaries, is today unveiling its second product, Nest Protect, a $129 smart device that hopes to do for the smoke and carbon monoxide detection market what Nest’s Learning Thermostat did for home temperature control. That is, it wants to turn what has become for many a mundane, malfunctioning domestic necessity into a reliable and stylish must-have. Artfully designed, connected up with your smartphone, and full of features that work better than what it wants to replace, Nest Protect is the startup’s biggest play yet to make a global name for itself and position itself as a serious player in the connected home. Of all the many things to disrupt in the home, why smoke detection? A couple of reasons, one personal and the other strategic. But it’s not just the sales volumes and existing bad, old products that spoke of opportunity to Nest Labs. While a thermostat is at its heart a (very) nice-to-have device, Protect takes Nest into the world of essentials. Smoke detectors are mandated in new-home builds in many countries, and insurance companies and others require you to have them installed, too. While Nest’s thermostat has some scaling issues to it — for example in the UK people cannot simply plug and play, but have to get professionals to install the devices because of the difference in electrical voltage — the same is not true for the Protect, which comes in a battery-powered version that can work, and therefore be sold, worldwide. Just as Apple has taken technology and managed to both make it slick/aspirational but at the same time human and personal, so too is Nest Labs hoping to do the same with the Nest Protect. Indeed, there are many things about the Protect that take the product from bureaucratically-ordered home essential into more personal territory. For starters, the device has a human voice, which currently can be set to English, Spanish or French. The voice is there to warn you in a calm way if, for example, its batteries are low, if it detects carbon monoxide, or if it’s about to make a very loud alarming noise. “Heads up,” is the common refrain of the female, American voice sounds rather a lot like the U.S. Siri — perhaps not a coincidence. It speaks more urgently simultaneously when an alarm is going off — a feature Nest says it created after reading research that noted children often sleep through the ringing noise of an alarm but will wake up at the sound of a voice. Nest then takes those signals of reassurance and runs with them, for example with a feature it calls “Nightly Promise.” This is a flash of green light that the device emits after you turn off the light, to let you know that it is working. If you walk under it in the dark, it detects your movement and lights your way. The human touch continues from there. If the alarm is possibly overreacting, rather than pushing lots of buttons or angrily tearing out 9-volt batteries (both usually involving clambering on to chairs or ladders to do so), you simply wave your arms — a double hat-tip not just to the frantic air-batting you may have done with a dishtowel in the past to get a mis-fired alarm to stop screeching, but also to the very 21st century wave of gesture-controlled gadgets. “Touch” is as much an operative word here as “human” is. While smoke alarms are usually completely out of reach on the ceiling, Nest has followed the route of many hardware makers and created smartphone and tablet apps that let you communicate with and control the detector. These apps — completely rewritten so that they also work with Nest’s Learning Thermostat for some ecosystem building — alert the user of low-battery alerts, alarm notifications, and one-touch access to emergency numbers. You can use the app to monitor several Protect detectors at once. Those detectors also work together to alert you to problems in other rooms in the house. 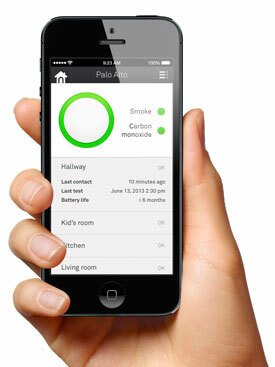 The apps, of course, work even when you are not at home, giving you a remote way of monitoring if there are any any smoke, fire, heat or carbon monoxide issues when you are not there. The Nest Protect has not been a quick follow-up to the Nest Learning Thermostat, the company’s first product, which launched two years ago almost to the week. But it has been no less anticipated. Nest Labs’ CEO Tony Fadell is commonly known as the “father of the iPod” (maybe we can call him co-parent). And that makes him and Nest Labs immediate magnets for attention, sometimes foiling the company’s best efforts to keep things like this launch under wraps until now. Just as Nest has been iterating on its Learning Thermostat (most recently opening up its APIs) we can expect to see more to come coming from Nest Protect in the future. Taking a leaf from the playbook used by sensor-filled smartphone app makers, you can also imagine that Nest will come up with further ways of using the many sensors built into the Protect to roll out further services. The sensors disclosed by Nest in the device include a photoelectric smoke sensor, a CO sensor, a heat sensor, a light sensor, ultrasonic sensors and activity sensors. “I don’t know what else we are going to do but it seems like there are many exciting things in the future,” Fadell says. This is also important considering that Nest is not the only one going after the smart smoke detector market (here and here are two other players). Just as one example, you can imagine several of these working as a house alarm system (remember, it’s called “Protect”). No surprise, then, that Nest says that in 2014 the Nest Protect will integrate with wired security systems. 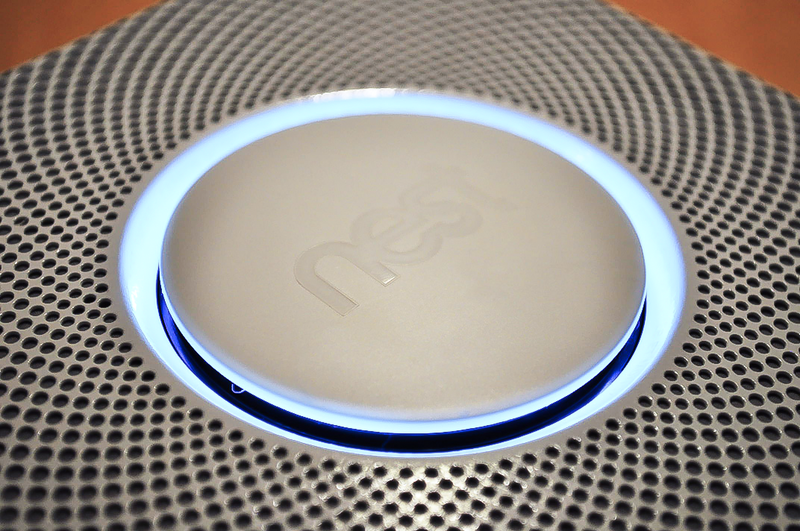 This is not just a hardware play, though: this also sets up Nest as the single app that can act as a hub to run all your connected home devices. We have a hands-on demo of how the device works — and how to install it — from co-founder and VP of engineering Matt Rogers, who boldly let us install the Nest Protect on one of his office’s walls to see how it works (this guy! amirite?). Stay on the stream directly following that to hear the one and only Tony Fadell talk about how he came up with the idea of the Nest Protect, defend against the idea of extra features as gimmicks, and much more. Nest Protect’s two black and white models are going on sale in November via Amazon, Apple, Best Buy and Home Depot in wired (120V) and battery-powered versions, starting first in the U.S., UK and Canada.